MSF calls on all armed groups to respect the safety of civilians and allow them access to healthcare. Medical humanitarian organisation Médecins Sans Frontières (MSF) is deeply concerned by the rapidly worsening situation in Hauts Plateaux, an isolated area in South Kivu, in the Democratic Republic of Congo (DRC). Thousands of civilians are trapped by conflict that has been raging in the area since the beginning of February 2010 between the Congolese army (FARDC), FDLR rebels and various armed groups. Violence against civilians is frequent, but the constant threat prevents the wounded from reaching the local hospital, where an MSF surgical team is working. Currently MSF is the only medical organisation providing direct medical care in the region. 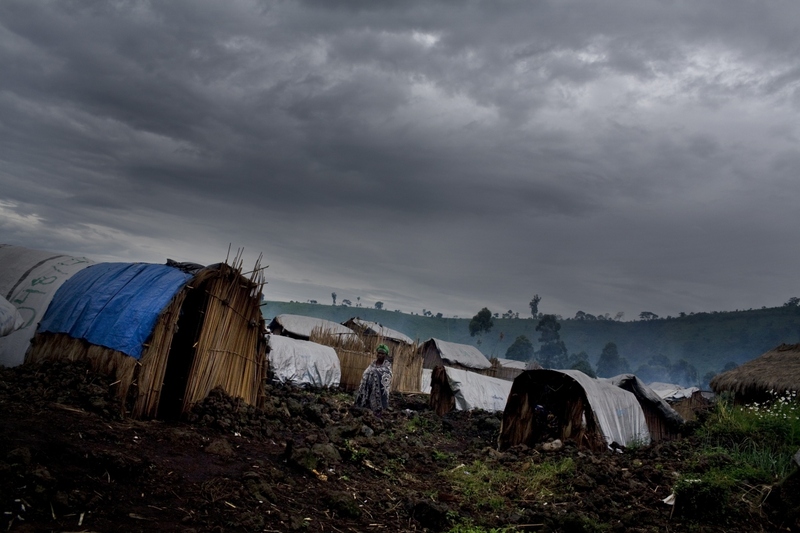 An IDP camp in DRC. This camp is home to over 28,000 displaced Congolese civilians who have been uprooted from their homes because of ongoing conflict. The intense fighting in Hauts Plateaux forced more than 10,000 people to flee their villages and seek refuge in the area of Mukumba in the beginning of February 2010. On February 10, an MSF medical team started providing emergency medical assistance in Hauts Plateaux to the displaced families. Since then, MSF has provided medical care in the village of Kihuha to more than 750 patients suffering mostly from acute diarrhoea and respiratory tract infections. The team has also received dozens of wounded people, including children, in need of emergency surgical care. A second MSF team, specialising in emergency surgery, arrived a few days later at the hospital in the nearby village of Katanga that is equipped with an operating theatre, to provide surgical care to those civilians wounded in the violent clashes. However, the team has been able to conduct very few surgeries because civilians are too frightened to travel to the hospital and seek help. As the situation in Hauts Plateaux is steadily deteriorating, MSF is gravely concerned over the fate of the thousands of internally displaced people trapped by the conflict. MSF calls on all armed groups to respect international humanitarian law and the safety of civilians and allow immediate access to emergency medical care for those wounded during clashes. “Wounded civilians are in desperate need of protection and emergency medical assistance. They deserve the right to have unobstructed access to our medical teams,” said Philippe Havet. MSF is currently working in Kalonge and Kitutu in South Kivu supporting health centres and operating mobile clinics for the provision of primary healthcare and emergency assistance to displaced people and host families. MSF is also supporting health centres, Baraka Hospital and a Cholera Treatment Centre in Fizi targeting the main causes of death and disease (namely malaria, malnutrition, tuberculosis and cholera) with an emphasis on reproductive health. In North Kivu, despite ongoing insecurity and violence, MSF runs medical programmes in Rutshuru, Nyanzale, Masisi, Mweso, and Kitchanga. 76 international staff are working alongside 1144 Congolese colleagues in MSF projects in North and South Kivu.